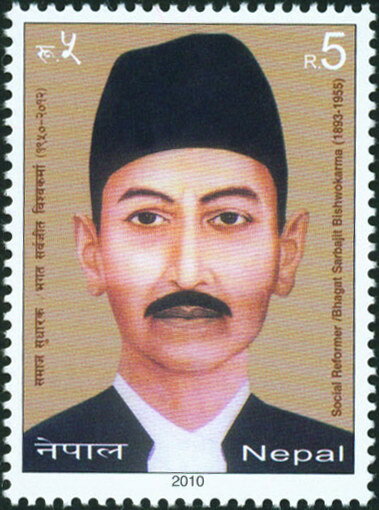 Social Reformer Bhagat Sarbajit Biswokarma (1893-1955). Welcome to AAS New Issue service for stamps of Bangladesh, Nepal, Qatar, Worldwide. Search new issue by Country or Topic/Theme world wide. The leading founder leader of oppressed Dalit free movement late Bhagat Sarbajit Biswokarma was born in Mulpani V.D.C. of Baglung district in 1950 B.S. According to historical document his name was also written as Bhagat Sarvajit Brinji. He had did Master (Acharya) in Sanskrit. In spite of this he also had did deep study and analysis of Hindu mythology like Beda, Upanishad, Puraan etc . He was the leading figure of Dalit Community who took stand that there was no any belief for untouchable discrimination to the dalit community in Hindu Mythology. He had established school for the dalit community in Hiliapani of the Baglung district. He put forward the depressed dalit free movement by establishment an organization named 'Bhiswo Sarvajan Sangh' in 1997 B.S. He had did 'Asahayog Aandolon1 that is for dalit people had stopped their traditional skill. Which event was also memorizing even now as an "Aaran ko Timdo (workshop of iron) Bhachhane Aandolon ". He was prisioned and given hard trouble claming him to against the crown and system on his demand of dalit also have right to wear Janai (a kind of inner wearing thread, especially use by Brahmin and chhetri). He went to India after his 17 month painful jail life. He was passed away in India in 2012 B.S. 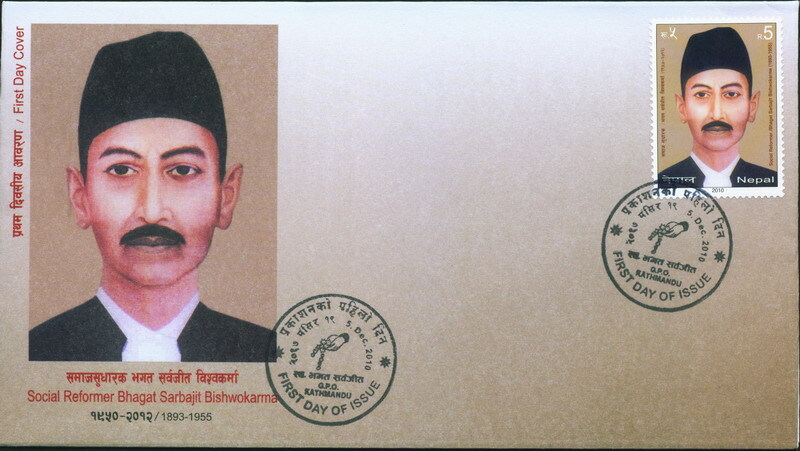 To honor his contribution for Nepali society and especially for the oppressed dalit community The Postal services Department issue this commemorative Postage stamp depicting his portrait.